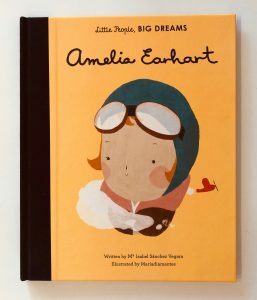 We’re big fans of the Little People Big Dreams series and this one about Amelia Earhart is currently getting a lot of attention from Ivy. The story begins with Amelia as a small child who is fascinated by the thought of flying. She dreams of flapping her wings and taking to the skies. As she gets older she visits air shows and her passion for flight grows and grows. As soon as she is able to sit in a plane she knows that this is where her destiny lies and she sets out to make it happen. After a lot of hard work she becomes the first woman to fly up to 14,000 feet and later becomes the first woman to fly across the Atlantic. As the story ends we see her take on the ultimate challenge – to fly right the way around the world. 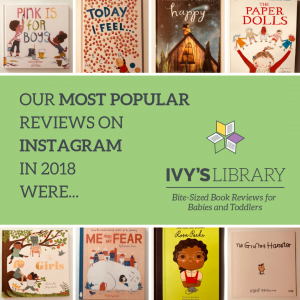 What were our Most Popular Reviews of 2018? Over the last few days I have been putting together a little plan for reviews and features in the coming year. As part of this I have looked back over 2018 and pulled together some data to help me see what kind of content you seem to like reading the most. I found the results fascinating! 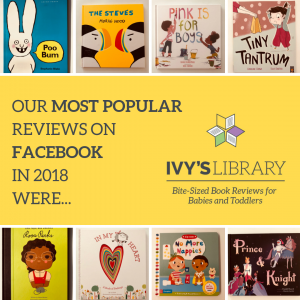 The lists below show the book reviews which received the most likes, comments and shares on social media in the last 12 months. 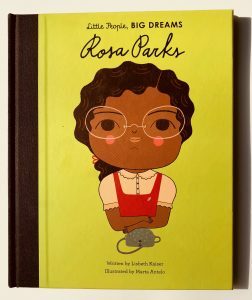 We have a number of books from this fantastic Little People Big Dreams series. I bought them with the intention of putting them away until Ivy was a little bit older but she’s really drawn to the pictures and often asks for them to be read to her. I recently visited the Frida Kahlo exhibition at the V&A museum as I am hugely fascinated by her story and her art. In the gift shop I bought Ivy a flowered headband in a similar style to the one you can see on the front cover. She loved it and squealed with delight when I showed her that she looked like the lady on the book. As a result we’ve read this one lots of times over the last few weeks! 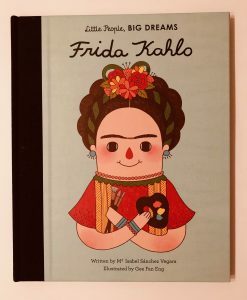 This beautifully illustrated title gives a brief overview of Frida Kahlo’s short and troubled life but deals with it in an age-appropriate way. We see that she suffers a childhood illness which affects her leg and is later involved in an accident which means she must spend much of her time in bed. Hi, I’m Maxine. I live in Kent with my husband Patrick, our daughter Ava who’s 4, two kittens called Polly & Tigger and a snake called Kaa. 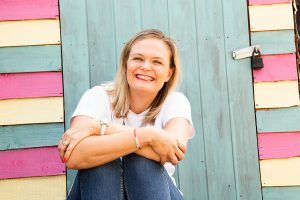 I’m a digital marketing consultant for family focused brands and businesses. What is your son/daughter’s favourite book? For Ava it’s The Gruffalo and Stick Man by Julia Donaldson – we have read these to her ever since she was super little and The Gruffalo was one of the first books she started to recite by herself at 22 months, she knew all the words – we couldn’t believe it. She loves the stories. Plus going on the hunt for a Gruffalo or following a Stick Man trail if we’re out for a walk. She will always pick up a “Stick Man” to take home. When I spotted the ‘Little People, Big Dreams’ series of books I knew I had to get them for Ivy. I bought 6 of them, each highlighting the life of an inspirational woman from history, with the intention of putting them away until she’s a tiny bit older. However she spotted them and was fascinated straight away. She’s too young to understand the stories and their significance yet but she seems drawn to the beautiful illustrations. Her favourite seems to be this one, which runs through the amazing life of Rosa Parks. It shows all of the injustices and inequalities she had to deal with as a child and the inspiring way in which she stood up and made a massive difference.I definitely recommend checking it out (along with the rest of the series).